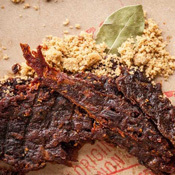 Spirited, yet refined, this is truly a one of a kind jerky. 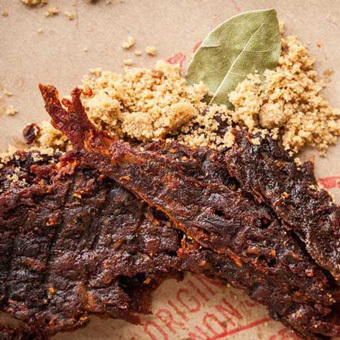 Jordan Barrocas and Daniel Fogelson, the visionaries behind Three Jerks Jerky, have created a fusion of east and west with their Chipotle Adobe Jerky. Uniting a traditional Filipino style marinade with a Mexican inspired Chipotle glaze, tender, succulent filets of beef are marinated and glazed to perfection, offering a piquant balance of sweet and smoky. Beef filet mignon, Tomato ketchup (Tomato concentrate made from red ripe tomatoes, Distilled vinegar, High fructose corn syrup, Corn syrup, Salt, Spice, Onion powder, Natural flavoring), Cider vinegar, Honey, Water, Red cooking wine (Wine, Salt, Potassium sorbate (preservative), Potassium metabisulfite (preservative)), Brown sugar, Soy sauce (Water, Wheat, Soybeans, Salt, less than 0.10% sodium benzoate as a preservative), Molasses, Red pepper sauce (Distilled vinegar, Red pepper, Salt), Olive oil, Garlic, Dried chipotle pepper, Salt, Spices, Worcestershire sauce (Vinegar, Molasses, Water, Sugar, Onions, Anchovies, Salt, Garlic, Cloves, Tamarind extract, Natural flavorings, Chili pepper extract), Dehydrated onion, Dried pasilla chile, Paprika, Mustard seed, Bay leaf. 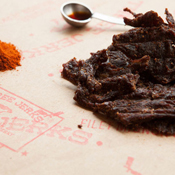 Venice, California based Three Jerks Jerky, the Original Filet Mignon Jerky, is the brainchild of best friends and fraternity brothers Jordan Barrocas and Daniel Fogelson who, not satisfied with other jerky on the market, set out to craft a premium, pure jerky unlike anything else available. These passionate foodies and entrepreneurs start with lean and succulent filet mignon - the finest steak from the most precious part of the cow. 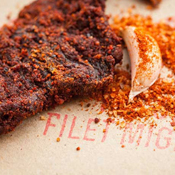 They then add dazzling flavors and only pure ingredients (no nitrates, nitrites or preservatives) to create an incomparable beef jerky.